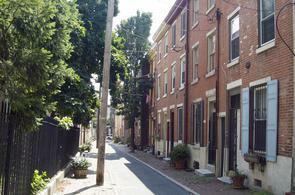 Built atop the path of an old streambed, Bodine Street is one of Northern Liberties' few intact colonial streets with original 18th-century structures. Until the 1780s, the area west of 3rd Street was mostly grass lots, grazing commons, and ponds belonging to English, Swedish, and Dutch settlers. Northern Liberties was crisscrossed with streams and creeks, and later development followed the pattern of that old landscape. Fourth, Fifth, and Sixth Streets did not even exist until 1800. In the 18th century, William Penn granted free or "liberty" land—essentially, bonus land—to "first purchasers" of lots within the original city of Philadelphia. 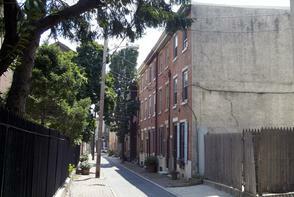 As a result, some prominent Philadelphians like Isaac Norris and Anthony Palmer owned large tracts of the "northern liberties" above and beyond Vine Street. They built stately bucolic retreats, but the liberty lands remained largely undeveloped until the early 19th century. By the early 1800s, Philadelphia was experiencing a boom in road construction to accommodate the expanding population and industrialization of outlying districts like Northern Liberties and Kensington. Before the arrival of a large immigrant labor force in the second half of the 19th century, much of the government-sponsored roadwork was performed by convict labor. Creeks, streams and ponds were filled in and paved over or used to power the burgeoning mills and factories. Dankanis, Mary L., et al. Guide to Northern Liberties. 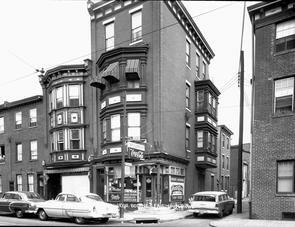 Philadelphia: The Northern Liberties Neighbors Association, 1982.